So now that I’m back in Sydney, at the desk, it’s time to start writing up a few of the producers I visited over the weekend in Orange. And what better way to start off than Philip Shaw Wines. Founded by Philip Shaw (in case you didn’t guess), this Orange icon is roundly regarded as one of the pioneers of the region, with first plantings dating back to 1988 – or just a few years behind Bloodwood (the first winery) and Canobolas Smith. That timing makes Philip himself one of the Orange originals, and there’s plenty of respect for him within the region. Actually, there’s an odd story about how he even ended up in Orange, as it was largely by chance (but he tells it much better than I do). Back then he was working for Rosemount in the Hunter Valley and was on the hunt for the right place to grow grapes. Initially drawn to Tasmania, he was in a plane that encountered issues and forced to do a few laps around Orange. Looking down from the circling plane he was intrigued by the slope of Mount Canobolas and decided to come back for a closer look. A little research and before you know it vines were in the ground, with the 47ha Koomooloo vineyard planted on a hillside at just over 900m in altitude. 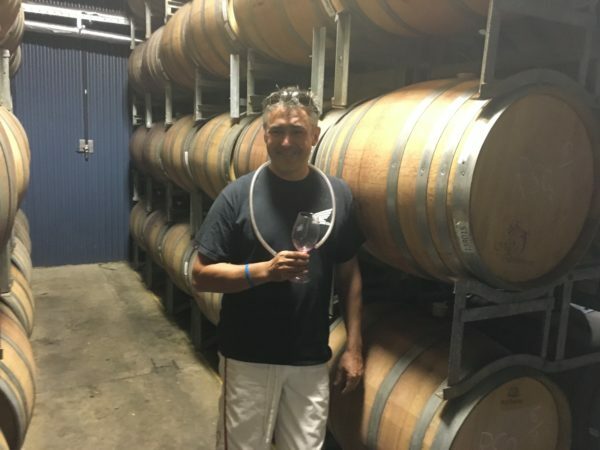 Since then the vineyard has taken on more importance, particularly after Philip finished up Rosemount/Southcorp (he was one of the most important winemakers in the country at one point) and he has devoted more and more time to his own eponymous wine label. But there’s change afoot, and when I stepped into the Philip Shaw winery on Sunday afternoon it wasn’t Philip greeting me but his son Daniel…. After completing vintages in Italy, North America, New Zealand and more (including a stint at Oyster Bay which he described as ‘really interesting’), Daniel is now at the helm and driving Philip Shaw Wines. To give an idea of the motivation, Daniel dropped this quote within the first few minutes of us arriving at the winery. ‘I want to make better wine than my Dad’. 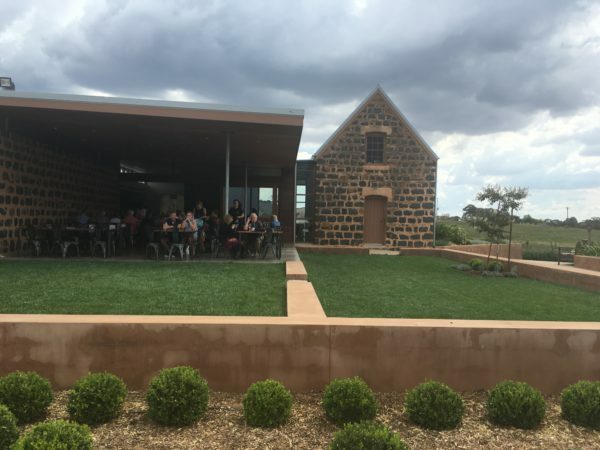 Coinciding with Daniel’s return, the Philip Shaw Wines cellar door has moved from Philip’s house up at the vineyard to alongside the winery, in a refurbished old stone cottage (see pic below). What hasn’t changed is the winery style, which has always been about an emphasis on acidity and restraint. The Koomooloo vineyard’s altitude ensures that it is a cool site, as demonstrated by the Cabernet still ripening and some weeks off picking, even though much of the region has already finished. Perhaps the main challenge then is how tight these look as young wines – they really need years to come together. Patience, grasshopper. On another note, it’s interesting to see the waning popularity of Sauvignon Blanc in Orange, and I didn’t taste anything over the weekend to convince me otherwise. The 2015 Philip Shaw Wines No.19 Sauvignon Blanc at least has some texture, though it’s still just another neutral white wine for mine. By contrast, Orange Chardonnay (like Snickers), can really satisfy. The (still to be released) 2015 Philip Shaw Wines No.11 Chardonnay is going to be very smart, even though it’s a style that needs 2-3 years minimum to be drinkable. I think the ’15 is almost too lean really, but you can see the greatness lurking around the corner. Hold and you’ll be very impressed. What did surprise me was the the 2015 Philip Shaw Wines No.8 Pinot Noir, which carries some of the ferrousness and the dry end of Orange Pinot but seems lighter, fresher and more varietal than many in the region. It could be a lock for sleeper status in the Philip Shaw range. By contrast, the 2013 Philip Shaw Wines No. 89 Shiraz is quite a brawny beast, carrying the open, choc0berry richness of a warmer year – less white pepper. Clearly some whole bunch influences just adding to the brawn too – definitely chunky and drying. It’s not a hero, but presents a good face of Orange Shiraz. While the harvest is only halfway through at Philip Shaw Wines, it was instructive to see how the juice is looking in tank/barrel. 2016 will go down for many Orange vignerons as the earliest on record, and you could already see the extra ripeness and weight in some of the fermenting samples (especially after the more settled ’15s). There are ways to counter this extra ripeness in the winery (like avoiding malo altogether for the Sauv, which is unusual as normally at least one parcel goes through), but little countering the fact that alcohol is a challenge this year. Indeed Daniel is letting the Shiraz and Cabernet crop hang out out there in spite of the fact that its ‘sugar ripe’, as flavour still hasn’t caught up. I banged on about Cab Franc on Monday, and a barrel sample of ’15 Cab Franc was another advertisement for the #Franctrain. Distinctly varietal, it’s firm and bitter, with dry extract and a cedary character that leans more towards Right Bank Bordeaux rather then a Loire Franc style. It still has that lovely hint of herbs though, and will make a lovely medium bodied wine. Big yes. The ’15 Cab sample, by contrast, is hard – it’s dry and long, but the back end is just not friendly. If there was a takeaway from all of these samples – bottled or not – it was just how ‘cool’ Orange wines can be. Admittedly Koomooloo is an elevated spot, but still, the acidity in this lineup was incredibly impressive. NSW, your cool climate region is ready. 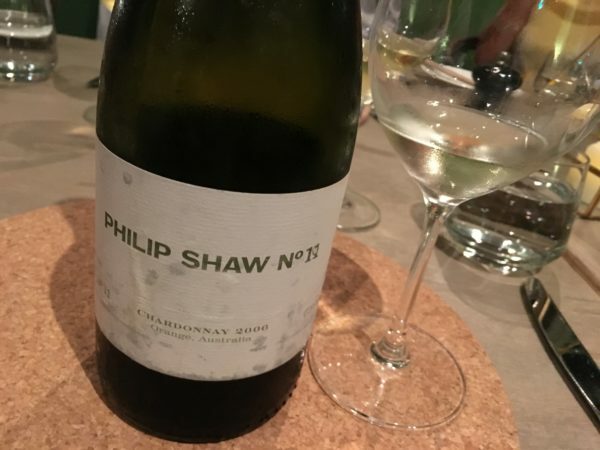 A final reminder came at dinner on Sunday night when a bottle of 2006 Philip Shaw No.11 Chardonnay lobbed up on the table. Green straw coloured, it was so youthful tasting that I had to double check it was actually a 2006. Seriously besides some funk on the nose and a little goats cheese on the edges it looked awfully youthful – 10 year old NSW Chardonnay, still in rude health.